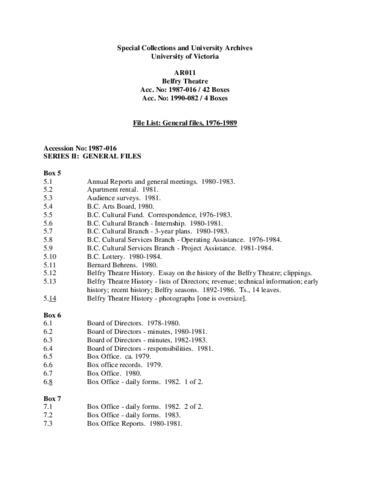 Series consists of records relating to the general administrative operations of the Belfry Theatre. Includes annual reports, correspondence with the B.C. Arts Board, the B.C. Cultural Fund, the Canada Council and similar organizations, box office reports, and records relating to Canadian Actors Equity Association, fund raising, publicity and subscriptions. Series arranged alphabetically by file title, within accessions. Acc. 1987-16, Boxes 5-20 and Acc. 1990-82, Boxes 2-3; Box 4, File 1-6.